"I won't always be here, and if I consider that, and regularly remind myself that I only have to be in a particular situation for an hour or two, whether I'm unhappy or not, I can manage it. I've been cold and miserable; I've been lost; deceived; I've been bored silly; drunk; my underpants have been wet from nervous agitation; the skin on my inner thighs has chafed to a fiery red from rubbing against wool; I've been robbed; fainted from shock; and I've been alarmed beyond words or stricken with fear hearing bitter words flare between friends in freakish eruptions of hatred in bizarre locations, since most sites are not right for confrontation, and when I have no right to speak and no involvement, except self-protection, I have become itchy, my skin a plane of heat, as if a match had been struck against it and my entire body set ablaze. But I was able to withstand it, only because I knew it would end." In the hypnotic, masterful American Genius, A Comedy, a former historian spending time ​in ​a residential home, mental institute, artist's colony, or sanitarium, is spinning tales of her life and ruminating on her many and varied preoccupations: chair design, textiles, pet deaths, family trauma, a lost brother, the Manson family, the Zulu alphabet, loneliness, memory, and sensitive skin--and what "sensitivity" means in our culture and society. A new edition of a contemporary classic, with an introduction by novelist Lucy Ives. 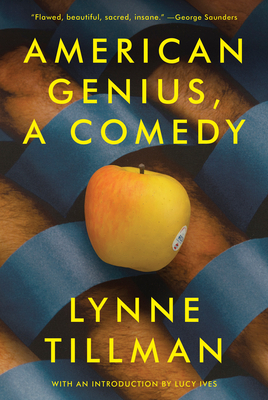 Lynne Tillman is a novelist, short story writer, and cultural critic. Her novels are Haunted Houses; Motion Sickness; Cast in Doubt; No Lease on Life, a finalist for the National Book Critics Circle Award; American Genius, A Comedy; and Men and Apparitions. Her nonfiction books include The Velvet Years: Warhol's Factory 1965-1967, with photographs by Stephen Shore; Bookstore: The Life and Times of Jeannette Watson and Books & Co.; and What Would Lynne Tillman Do?, a finalist for the National Book Critics Circle Award in Criticism. Her most recent short story collections are Someday This Will Be Funny and The Complete Madame Realism. She is the recipient of a Guggenheim Foundation Fellowship and an Andy Warhol/Creative Capital Arts Writing Fellowship. Tillman is Professor/Writer-in-Residence in the Department of English at The University of Albany and teaches at the School of Visual Arts' Art Criticism and Writing MFA Program in New York. She lives in Manhattan with bass player David Hofstra.